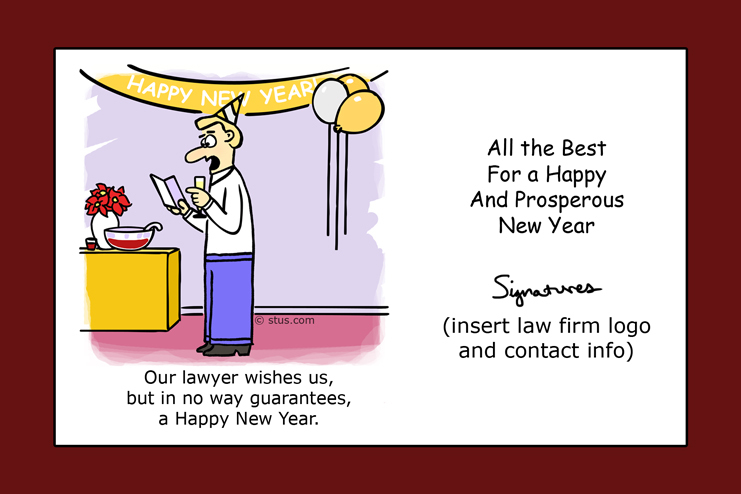 Any of our 2,000+ cartoons can be converted into a custom holiday ecard, complete with personalized message, handwritten signatures, firm name, firm logo, address, etc. The red border can be change to match your logo color. We can even customize the cartoon caption and colorize black / white images. If you are going to lay out the card yourself, our licensing fee is $0.75 per recipient for the first 500, $0.60 for recipients 501-1,000, and $0.45 per recipient over 1,000. This pricing is less than 1/3 the average cost of a print card and postage. If you wish for us to do the layout, the layout fee is $150 and the licensing fee is as noted above. You will be provided with proofs via email and may tweak until satisfied. Changes to the cartoon text and artwork (including colorization) are available for a reasonable extra charge that depends on what you want done. You deliver the ecards from your email, so we never have possession of your client information. Rather, we send you either the cartoon image (for do-it-yourself clients) or the fully-layed out card (like the sample above) by email attachment. You save the image to your hard drive, then insert it into the body of an email to your recipient. The image is in high enough resolution that you can re-size it simply by dragging the corners until you like how it looks. Then, you may add whatever personalized text you like below the image, just like with a regular email. The above sample is fully-functional, so feel free to right-click-save it to your hard drive now and play around with it in your email program. Questions? We're available 9-5 Pacific Time at 619-297-4001, or stu@stus.com. Personalized ecards save you a couple of bucks per card. We can turnaround a fully-personalized ecard in about a day, so you can do this last minute. It takes far less of your time to send ecards via email than to label envelopes individually (and you won't have to waste time trying to figure out if the physical mailing address is accurate and perfectly formatted). If the card doesn't go through, you will receive an email bounce notice immediately and can follow up. We can personalize the cartoon, interior message, and border for different departments or individual attorneys. Small extra charges apply. You can easily include a custom message below the ecard image, and even have active hyperlinks back to your website. Logically, having a card emailed by an individual, with that person's contact information below the ecard, is more effective than a generic print card sent by the person's employer.